A "I Voted" sticker is shown by a keyboard in the Voting Machine Hacking Village during the Def Con hacker convention in Las Vegas, Nevada, July 29, 2017. 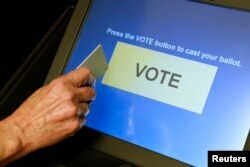 "We've recently added Albert sensors to our system because I believe voting systems have tremendous vulnerabilities that we need to plug; but also the voter registration systems are a concern," said Neal Kelley, chief of elections for Orange County, California. "That's one of the things I lose sleep about: It's what can we do to protect voter registration systems?" FILE - An elections official demonstrates a touch-screen voting machine at the Fairfax County Governmental Center in Fairfax, Virginia, Oct. 3, 2012. As of August 7, 36 of 50 states had installed Albert at the "elections infrastructure level,"according to a Department of Homeland Security official. The official said that 74 individual sensors across 38 counties and other local government offices have been installed. Only 14 such sensors were installed before the U.S. presidential election in 2016. "We have more than quadrupled the number of sensors on state and county networks since 2016, giving the election community as a whole far greater visibility into potential threats than we've ever had in the past," said Matthew Masterson, a senior adviser on election security for DHS. "When you start to get dozens, hundreds of sensors, like we have now, you get real value," said John Gilligan, the chief executive of CIS. "As we move forward, there are new sensors that are being installed literally almost every day. Our collective objective is that all voter infrastructure in states has a sensor." Maria Benson, a spokesperson for the National Association of Secretaries of States, said that in some cases installations have been delayed because of the time spent working out "technical and contractual arrangements." The South Dakota Secretary of State's office did not respond to a request for comment. The Wyoming Secretary of State's office said it is currently considering expanding use of the sensors.